When I was a kid, my mum used to roast the purple-skinned, white-fleshed sweet potato, and the orange sweet potato or kumara was an exotic rarity. Kumara is now a staple of your average fruit and vegetable shop and it is almost impossible to find the old fashioned white sweet potato my mother used to roast. When I do see it and buy it out of a sense of nostalgia, I can’t really think of what else to do with it apart from roast it. The orange sweet potato, or kumara, is endlessly adaptable and can be used in soups, curries, salads, or roasted, mashed and thrown into savoury or sweet muffins. Baked in their jacket, dressed with lemon juice and olive oil and served with some sides, they even become a base for a meal in themselves. As I subscribe to the nutritional principal that the more colorful the vegetable is, the better it is for you, it stands to reason the orange sweet potato must be better for you than the plain old white variety. 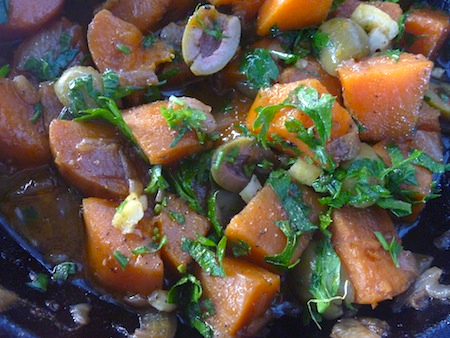 This unusual sweet potato salad comes from Claudia Roden’s book, Arabesque, a collection of easy and accessible recipes from Turkey, Morocco and Lebanon. Sweet potato is not a vegetable I associate with Arabic cooking and in all my years of cooking it, I’ve never really thought of braising it. 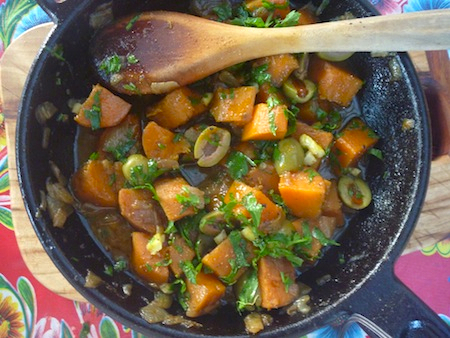 This sweet potato salad has a mellow sweetness, offset by the tartness of the lemon juice and green olives. Finely chopped parsley gives it a value added flavour boost that makes it feel choc-a-block full of nurturing, nutritional goodness. Fry the onion in two tablespoons of the oil until golden. Cut sweet potatoes into about 2.5 cm (1 inch) cubes, add to the pan and just cover with water (you don’t want your sauce to be too watery). Add ginger, cumin, paprika, a little salt and two more tablespoons of the oil. 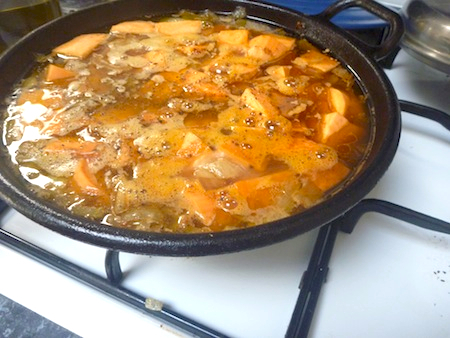 Cook until sweet potato is tender, turning the potatoes over gently so they cook all sides and the juice is reduced to a sauce. Take care that the potato doesn’t disintegrate. Serve at room temperature mixed with olives, lemon juice, the remaining olive oil, chopped parsley and some finely chopped preserved lemon, if desired.